The FTD® Forever Dear™ Arrangement is a beautiful traditional bouquet that makes a heartfelt final tribute. 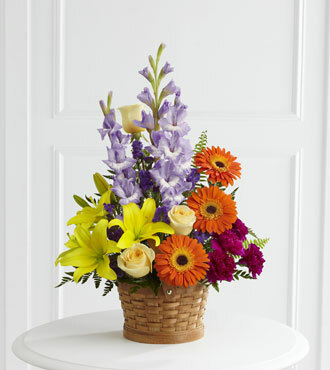 Lavender gladiolus reach upwards, while bright yellow Asiatic lilies, orange gerbera daisies, plum carnations and purple statice bring brilliance to this assortment. Crème de la crème roses add softness and serenity to this lovely floral gift which is accented with leatherleaf and sword fern stems. Displayed in a natural woven handled basket, this colorful remembrance basket offers comfort to the bereaved when delivered fresh to the home or memorial service. GREAT basket includes 15 stems. Approximately 27"H x 19"W.
GREATER basket includes 19 stems. Approximately 32"H x 22"W.
GREATEST basket includes 28 stems. Approximately 32"H x 23"W.